Wild geese species, such as Canada geese, eat things like grass, eelgrass and skunk cabbage leaves. In the fall and winter, they often eat grains, corn, seeds and berries. 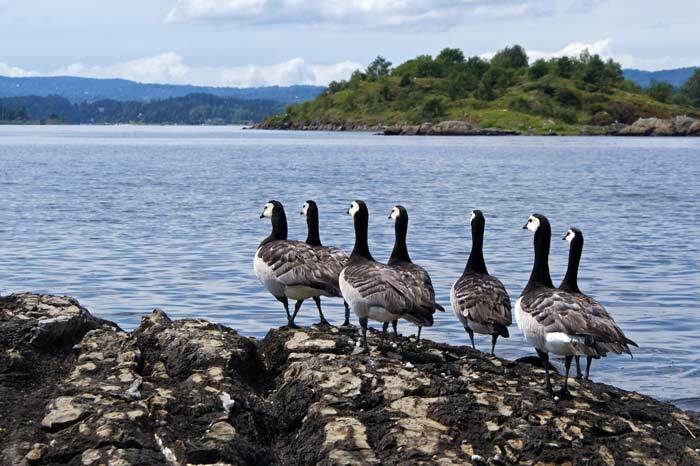 Some subspecies of Canadian geese live in and around cities and towns. These geese usually eat grass during all seasons. Domestic geese species eat grass, lawn clippings, clover, bluegrass and bromegrass. They often prefer to graze and forage their own food, so people who keep geese should be sure to keep a natural pasture area that is not treated with harmful chemicals. Although geese can forage their own food, they can also eat grain feed. Domestic goslings can start foraging as young as 5 to 6 weeks old. Before that, they should eat chick starter feed.